(Bloomberg) -- Oil closed at its highest yet this year as OPEC and its partners committed to continuing production cuts until at least June, when they will meet to discuss an extension. Futures advanced 1 percent in New York on Monday. The group known as OPEC+ closed a weekend meeting in Baku, Azerbaijan, having reaffirmed an intent to continue output cuts. At the same time, production in Venezuela and Iran is expected to continue declining. The short-term assurances of continued cuts are likely to keep U.S. crude trading between $50 and $65 a barrel for the next few months amid a “fairly balanced” market, said Kyle Cooper, a consultant at Ion Energy Group. “I think OPEC is probably OK with that and I think the markets and consumers are probably comfortable with that,” said Cooper. 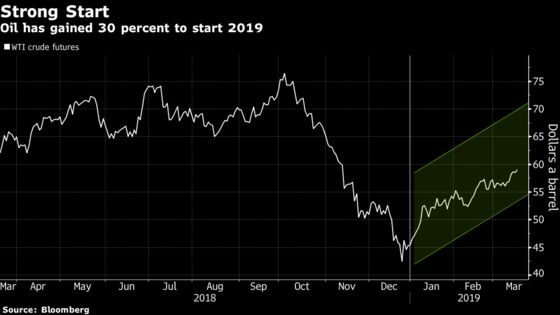 Oil in New York has rallied 30 percent this year as OPEC+ worked to offset a glut fed by surging U.S. shale production. Meanwhile, the fears of a global slowdown that sent oil prices crashing at the end of 2018 have receded and steady growth in equities markets has allayed concerns of a demand drop. West Texas Intermediate for April delivery gained 57 cents to settle at $59.09 a barrel in New York. Brent for May settlement gained 38 cents to end the session at $67.54 on the London-based ICE Futures Europe exchange. The global benchmark crude settled at an $8.16 premium to WTI for the same month. 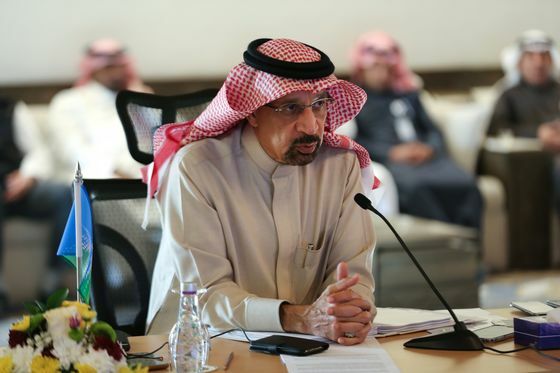 As OPEC+’s Joint Ministerial Monitoring Committee met Monday, Saudi Arabian Energy Minister Khalid Al-Falih said the group remains committed to curbing output during the supply glut. There was less evident support for extending the curbs from Russia and Iraq, the coalition’s other two biggest suppliers. They suggested the group should monitor the market until May or June before making a decision, as developments in Venezuela and Iran may impact supply . Gasoline was up 1.4 percent to settle at $1.8828 a gallon. Black smoke billowed across Houston’s skyline Monday morning after eight petrochemical tanks caught fire near the city’s shipping channel. Chevron Corp. will have to overcome shale headaches including water disposal and falling output from older wells if it’s going to reach its goal for a massive boost to production from the biggest U.S. oil basin, according to BloombergNEF. Libya boosted crude production by a third after restarting its biggest field, and its top oil official sees further gains when companies like BP Plc invest and start pumping oil in the politically divided OPEC nation.